Hi everyone, so I’m so sorry that I have been gone for so long. I have been so busy with my kids/work and school. I am happy to say that I am half way finished with my schooling…Yay..!!! My children and I are starting to get ready for their school shopping as well, so we have been busy doing doctor visits and all that great stuff. Now I would love to say that a few weeks ago I ordered some books and flash cards for my kids which I will do a review on for you guys on my next post. Today however, I wanted to share some New and Exclusive titles from Usborne Books & More. Welcome to Silver Spires (Book 1): Katy is nervous about going to boarding school for the first time, especially as she’s got a big secret to hide. The girls in her dorm seem really nice, but when someone sets Katy up for a fall, how will her new friends react? 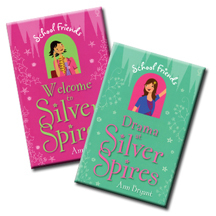 Drama at Silver Spires (Book 2): Georgie loves acting and is determined to win her favorite role in the school play. But her audition goes drastically wrong and an older girl steals the show instead. Will Georgie ever get her chance in the limelight now? These are some really cool new books for your girls, that will definitely keep them reading and interested. As always Usborne Books are always safe and inspiring . Now these books are for cildren 10 years and older, there are approximately 150pp. The Paperback copy is very affordable at only $4.99.